117 Commonwealth is located on the north side of Commonwealth, between Clarendon and Dartmouth, with 115 Commonwealth to the east and 119 Commonwealth to the west. 117 Commonwealth was designed by architect Charles K. Kirby and built in 1871, probably for speculative sale, on land which he purchased from the Commonwealth of Massachusetts on August 24, 1871. Click here for an index to the deeds for 117 Commonwealth. On October 2, 1871, 117 Commonwealth was purchased from Charles Kirby by dry goods merchant Walter Hastings, Jr. He and his wife, Elizabeth (Glidden) Hastings, made it their home. They previously had lived in Charlestown. Bainbridge Bunting’s Houses of Boston’s Back Bay indicates that 117 Commonwealth was designed by Cummings and Sears and built ca. 1876. This is not correct. 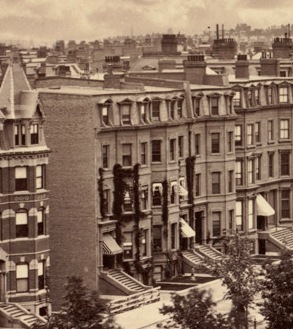 Walter Hastings did have Cummings and Sears design two contiguous houses in 1876-1877 at 113 Commonwealth and 115 Commonwealth, and the Hastingses made 115 Commonwealth their home after it was completed. 117 Commonwealth, however, was built five years earlier. Charles Kirby was an architect and building contractor, and is not known to have used other architects to design the houses he had built. 117 Commonwealth is virtually identical to 111 Marlborough, designed by Charles Kirby ca. 1872. 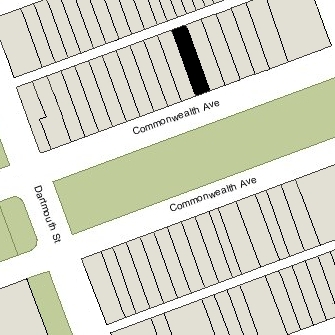 Walter and Elizabeth Hastings continued to live at 117 Commonwealth during the 1876-1877 winter season, but moved thereafter to 115 Commonwealth. 117 Commonwealth was shown as vacant in the 1878 Blue Book. On March 12, 1878, 117 Commonwealth was purchased from Walter Hastings by merchant and banker Ezra Howes Baker, Jr. When William Hastings purchased 117 Commonwealth from Charles Kirby, the lot was 28 feet wide. The normal practice in the Back Bay was for the twelve inch thick party walls between houses to be built so that the boundary line would run through the middle of the wall and the owner of each house would own and be responsible for half of the party wall. 117 Commonwealth was built several years before the houses on either side, and the party walls were placed entirely within the lot rather than straddling the boundary lines. In 1876, when Walter Hastings had 115 Commonwealth built, he adjusted the boundaries so that the eastern six inches of the party wall with 117 Commonwealth became part of 115 Commonwealth’s land, making it 28 feet 6 inches wide. When he sold 117 Commonwealth to Ezra Baker, the lot was specified as 27 feet wide, and Walter Hastings retained the western six inches with half of the party wall on it. He died in October of 1879 and in November of 1879, when 119 Commonwealth was being built for Samuel and Ruth (Haskell) Brown, Walter Hastings’s estate sold the Browns the six inches so that they would own their half of the party wall. Ezra Baker and his wife, Mary Ann (Martyn) Baker, made 117 Commonwealth their home. They previously had lived at 22 Worcester. Their five surviving children lived with them: Charles Morrill Baker, Ezra Henry Baker, Arthur Martin Baker, Edith Helene Baker, and Esther Mary Baker. Charles Baker, an investment banker, married in October of 1886 to Edith Clarke Demmon. 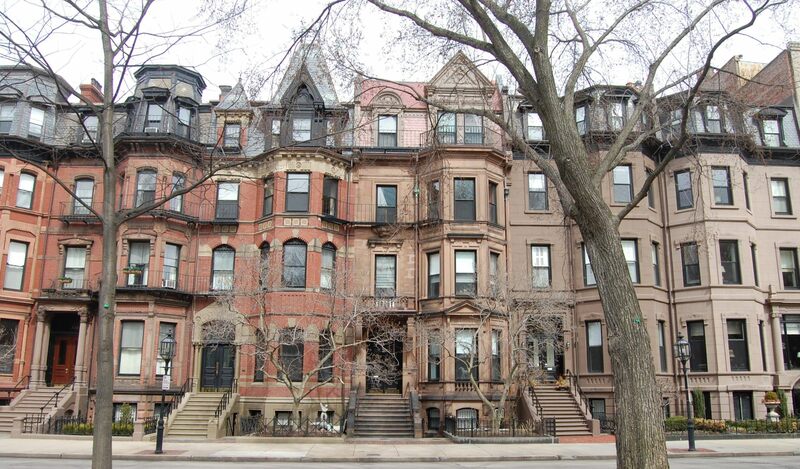 After their marriage, they moved to the Longwood district of Brookline. Edith Helene Baker died in March of 1887. Ezra Baker died in June of 1888, and on June 1, 1889, his estate transferred 117 Commonwealth to Mary Ann Baker. She continued to live there with her unmarried children, Ezra, Arthur, and Esther. Arthur Baker moved to Colorado Springs in about 1889, where he became a broker dealing in mining stock. Ezra Baker, an investment banker, married in November of 1892 to Martha Gertrude Keyes. 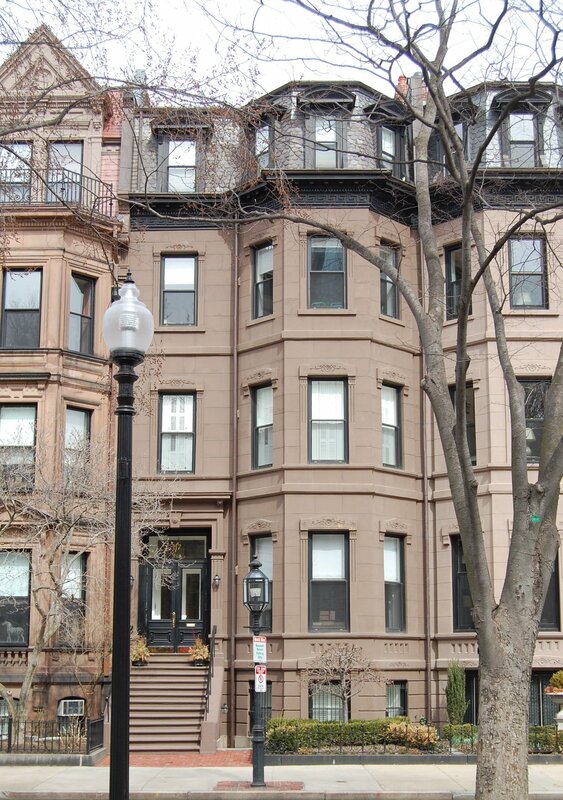 After their marriage, they lived at 294 Marlborough. Esther Baker married in April of 1893 to John Hitchcock, Jr., a lawyer and trustee of estates. He previously had lived with his widowed mother, Sarah Frances (Crosby) Hitchcock, at 264 Commonwealth. After their marriage, they lived briefly at 117 Commonwealth with Mary Ann Baker. 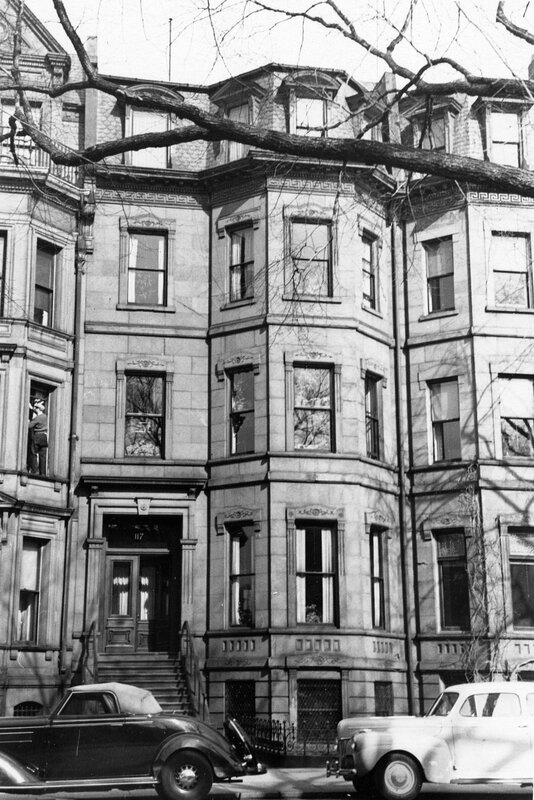 During the 1894-1895 winter season, they lived at 342 Beacon, and during the 1895-1896 season they lived at 415 Commonwealth. By the 1896-1897 season, however, they were living at 117 Commonwealth once again. John Hitchcock died in August of 1910, and Esther and their children continued to live with her mother. Mary Ann Baker died in December of 1917. Esther Hitchcock continued to live at 117 Commonwealth until her death in August of 1945. On December 20, 1945, 117 Commonwealth was acquired from Mary Ann Baker’s estate by real estate dealer Julius Kalman (Kalmanovitz). That same month, he applied for (and subsequently received) permission to convert the property into eight apartments. On March 1, 1951, Julius Kalman transferred 117 Commonwealth to Haven Realty, Inc., one of several real estate firms he owned. In March of 1954, Julius Kalman’s real estate firms had been identified as among the victims of George L. Maitland, who had been indicted for obtaining loans based on fraudulent representations. On February 6, 1956, Julius Kalman committed suicide at his home in Allston. The Boston Globe reported that the suicide was “on the eve of one of the trials growing out of the so-called Maitland loan fraud case” in which he “was to have been a star witness” for the prosecution. On March 29, 1957, Haven Realty transferred 117 Commonwealth to Jennie Loitman Barron, Mark R. Werman, and Jacob Grossman, executors of the will of Julius Kalman. On August 26, 1958, 117 Commonwealth was acquired from Julius Kalman’s estate by real estate dealer Lester Werman and his wife, Ruth (Ehrlich) Werman. They lived in Waban. Lester Werman was the brother and business associate of Mark Werman, an insurance broker, former treasurer of Haven Realty, and one of Julius Kalman’s executors. On May 25, 1977, 117 Commonwealth was purchased from Lester and Ruth Werman by William B. Allred, an engineer. In May of 1978, he applied for (and subsequently received) permission to increase the number of units from eight to nine. On May 8, 1989, he transferred the property to himself and Elizabeth N. Allred as trustees of the Allred Nominee Trust. At the time of the transfer, he was a resident of Marstons Mills on Cape Cod and she was a resident of Boston. On June 9, 2000, 117 Commonwealth was purchased from the Allred Nominee Trust by 117 Commonwealth Realty Inc. Norman S. Drubner, president and treasurer). In May of 2000, prior to taking title, it had applied for (and subsequently received) permission to remodel the property and reduce the number of units to two. On April 25, 2001, 117 Commonwealth Realty Inc. converted the property into two condominium units, the 117 Commonwealth Condominium.